After a near-death tour bus accident (he did die briefly actually) led Michael Orlando (aka Michael Vampire) to put Vampires Everywhere down for an eternal slumber (vampire pun! 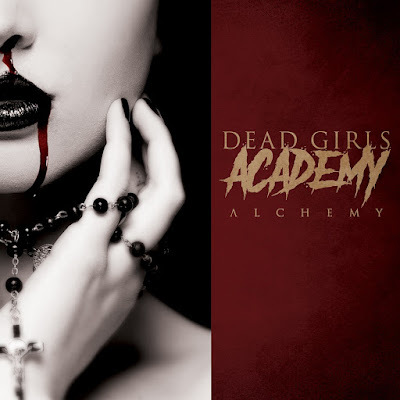 ), Dead Girls Academy was born, a band that should help to quench the thirst for any and all fans of his prior affiliations. On the band’s debut album Alchemy, Orlando conducts a stirring cacophony of blistering, razor sharp guitars, ultra-slick melodies and sparkling production (“Medicine,” “Forever,” “Too Late,” “I’ll Find A Way”), though he shines just as bright (if not brighter) during Alchemy’s more tempered moments (“I Can’t Feel A Thing,” “Conversations,” “Far Away”). The only knock on Alchemy is that it hits a bit of a lull during its latter stages, but in all honesty, it’s hard to believe that after three grueling years of reconstructive surgery and rehabilitation that Orlando could sound this on point so soon. It’s a touch awe-inspiring actually. If you’re still spinning old Vampires Everywhere, I Am Ghost or Relapse Symphony records, you better run, not walk, to get yourself a copy of Alchemy.